Your 10 day Tasmanian adventure begins and ends in Hobart, Australia's second oldest capital city. The first half of your trip takes you to historic town of New Norfolk, to Strahan, where you can take one of the famous Gordon River Cruises to Sarah Island, and then to the breathtaking Cradle Mountain-Lake St. Clair National Park. Then you're off to Launceston, the center of the 'Valley of the Senses', and to St. Helens, a working fishing port famous for the Bay of Fires stretch of beaches. The first leg of your trip is a short one, 36 km north and west (about 40 minutes) up the Brooker and Lyell Highways to the Derwent Valley region. Located on the Derwent River, New Norfolk is considered 'Tasmania's best kept secret.' Founded in 1808 by settlers from Norfolk Island, New Norfolk is a town rich in history. Here you can see the oldest continuously run inn, the oldest Anglican Church, and other historic homes and sites. The grave of Betty King, the first white woman to set foot on Australian soil, is located in Magra not far from New Norfolk. Take a drive up to Pulpit Rock Lookout for great views of the river, and then dine out at Tynwald, a historic mansion built in 1830. Located a short walk to the village of Strahan and 150 meters from West Strahan Beach, this park is situated on four lush acres and features a wandering creek throughout the property. The park offers guests laundry facilities and a BBQ area, and is close to a swimming beach, children's park, jetty and boat ramp, and general store. Accommodations include full self-contained family cabins and budget onsite units. Along this 35 km journey back in time, you will hear stories about the pioneers who built the railway, stop at several stations for lunch and refreshments, and enjoy the magnificent views of rainforests, rivers and gorges. After 5 hours aboard the traditional steam locomotives, you arrive in Queenstown and are shuttled back to Strahan. If you are living large on this trip, book a seat in the Premier Carriage, where you can indulge in delicacies served by an attendant. 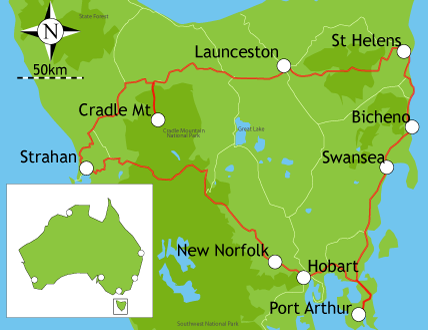 Drive 146 km north and east (about 2 hours) via Henty Road, Zeehan and Murchison Highways, and Cradle Mountain Development Road to the beautiful Cradle Mountain-Lake St. Clair National Park. Known worldwide for it's six-day bushwalk, the Overland Track, this magnificent park boasts countless natural wonders. Set out on your own, or take a guided tour on foot, in a canoe, or 4WD. Guided fishing tours are also available. Plan to spend two days here in Cradle Mountain, especially if you love the outdoors. If you prefer to wander through galleries, shops, and dining out, spend 2 days at your next stop, in Launceston. Both stops are worth more than one day. Located two km from the center of Launceston, this park is situated on three hectares of former parkland, and features three amenities blocks, laundry facilities, free BBQs, tour booking assistance, camper's kitchen with TV, car washing facilities, and a bathroom for babies. Choose from full self-contained deluxe and standard cabins, and onsite caravans, as well as powered caravan and campervan sites, and camping sites. A short walk from the city center, the Cataract Gorge is a fun attraction for families. Victoria gardens, walking trails, lookouts, a swimming pool, cafe and restaurant enable everyone in your group to find something they enjoy. Take a ride on the longest single span chairlift in the world! Today, make your way to the northeast coast of Tasmania, 148 km east (just under two hours) via the Tasman Highway and other minor roads. The largest town on the east coast, St. Helens is a fishing port known for great beaches and huge sand dunes. Protected by Georges Bay, St. Helens is adjacent to St. Helens Point and Humbug Point, both with extensive recreation areas. St. Helens is also famous for its Suncoast Jazz Festival in June. Just ten minutes north of St. Helens is the Bay of Fires, 35 km of pristine white sand beaches, beautiful rock formations, and glorious blue water. The entrance is at Bingalong Bay, with Mount William National Park at the end. St. Helens is Tasmania's largest fishing port. Why not charter a fishing boat (and perhaps hire a guide) and try your hand at fishing for deep-sea marlin and tuna? Drive 28 km west to Pyengana to see the St. Columbia Falls, Tasmania's tallest waterfall. Walk 20 minutes in the rainforest to get to the falls, and then take photographs from the platform at the top. Drive 76 km south (about an hour) down the north east coast via the Tasman Highway. Once known for its whaling and sealing industries, Bicheno is now famous for crayfish and penguins! Tour the Governor Island Marine Reserve, walk the beautiful north east coast, or explore the Freycinet National Park, just south of Bicheno. Giant Tasmanian crabs, seahorses, crayfish and other marine life can be viewed in giant glass tanks in the Aquarium. See Tasmanian ketch, dubbed 'The Enterprise', built in 1902, and pick up souvenirs in the gift shop. The restaurant serves lunch, morning and afternoon tea. A short drive today, 43 km south and west via the Tasman Highway to Swansea. A charming town situated on Great Oyster Bay, its heritage buildings, museums, and views of Freycinet National Park make Swansea a relaxing stop on your Tasmanian adventure. Located in the center of the oldest rural municipality in Australia, Swansea is home to many buildings from the mid-1800s. Just outside Swansea overlooking Great Oyster Bay is Kate's Berry Farm. You'll find freshly picked raspberries and strawberries for sale from November to April, as well as Kate's homemade ice cream, jams, and berry wine (available year round). Located in a heritage building, the Glamorgan Community Centre houses a museum dedicated to Swansea's pioneering history, as well as memorabilia from World War I and II. Pick up a copy of the booklet, Heritage Walk, Swansea, and enjoy a leisurely walk through Swansea, learning about the historic sites as you go. Drive 149 km south (about 2 hours) down the north east coast via the Tasman and Arthur Highways (and minor roads). Port Arthur, with only 200 inhabitants, is entirely dedicated to the former prison, the researchers who study its history, and the tourists who visit it. You can take one of several guided tours to see the prison buildings, the officers' homes, the dockyard, church and hospital. The museum shows artifacts from convict days, many recovered through on-going archaeology. Port Arthur hit the headlines in 1996, when a man went on a shooting spree and killed 35 people. Many of the staff lost close relatives and friends so, please, read the memorial plaque, but do not discuss this tragedy with staff. This 600-metre trail from the Hospital to the Commandant's House takes you into the bushland, where you will see the remains of a failed attempt at self-sufficiency for the convict settlement reservoirs, aqueducts, flour mills and water wheels. You will also see how a free community grew up; how white occupation affected the landscape; and how native plants have recovered. The catamaran MV Marana will take you on a short cruise on which you can see the gorgeous coastline, the Isle of the Dead, and the boy's prison, and learn about the convict ship building industry. The last leg of your trip takes you 94 km north and west (a little over an hour) back to your starting point, via the Arthur and Tasman Highways. Hobart, the second oldest capital city in Australia, is a vibrant port city with a rich and diverse history and thriving arts scene. Situated on the Derwent River at the foot of Mount Wellington, Hobart offers visitors spectacular views. Founded in 1804 as a penal colony, the city has integrated its convict heritage into its everyday charm. Be sure to stop in a bookshop; Hobart is fast coming a book buy.